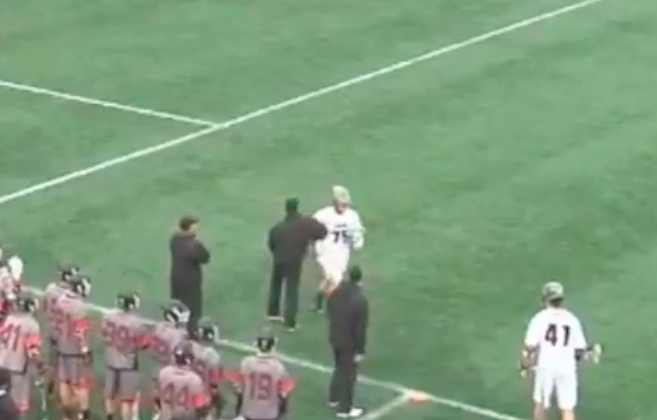 Princeton men’s lacrosse coach Chris Bates is out of a job today after he threw an elbow at a Brown player during a game last weekend. Bates was put on leave following the April 2 incident, and on Wednesday the University announced he is no longer employed at the school. A video of the incident was posted to Twitter, and it shows Bates clearly going out of his way to elbow Brown midfielder John Yozzo-Scaperrotta. However, while clearly immature and unsportsmanlike, the elbow appeared to be relatively harmless. Bates was in the midst of his seventh season as the Tigers head coach and had led the squad to Ivy League championships in 2010, 2012 and 2015. Princeton said it will conduct a national search for his replacement while offensive coordinator Matt Madalon serves as head coach in the interim. Chris Bates, whose calmness and strength serve as the bedrock of the Princeton men’s lacrosse program, is in his seventh year as the head coach of the Tigers. If this incident is any indication, calmness takes a backseat in this program’s bedrock.